Last year from late September into November I was feeling extremely stressed and anxious. A big part of it was due to all of the politics leading up to the midterm elections in November. I unplugged from the internet as much as I could, stopped reading news online and limited myself to listening to public radio to a short time in the morning and late afternoon. It helped a lot. But then UN and US climate change reports also came out and I was knocked for a loop. While unplugging from most news helped with politics, there was no option to unplug from living on this planet. Given what these reports said I could no longer be optimistic that governments would come to their senses and begin the massive effort needed to curtail global warming. Not only are we not going to limit warming to less than 3C, we are going to careen right past it into complete and utter disaster. I found myself during quiet moments in my day suddenly overwhelmed by grief or anxiety. Any time I heard mention on the news of burning more coal and oil, the sham that is the Paris Climate agreement, the tech-evangelists talking about carbon sequestration (a technology that does not currently exist), and all the myriad denials from so many quarters, I would get incredibly angry and start yelling at the radio. I’d find some relief when I meditated or did a hard bike workout, but these activities did not solve the larger problem. Fast forward to today. I am feeling much better thanks to the counsel of a couple good friends and books. One of those good friends sent me a book called Active Hope: how to face the mess we’re in without going crazy. I am in the midst of reading it slowly because I am paying close attention to the details, to the exercises, to stopping and thinking about not just what the words mean on the page but what they mean in my life and in the world. About the same time Active Hope arrived, I began reading a book called Who Do We Choose to Be? by Margaret Wheatley. I learned of the book through the Longfellow Transition Newsletter. They were reading it for an inner transition book group. Yes, these are the same people I attended a book group with a couple years ago when we read Making Home by Sharon Astyk. I never finished reading the book with the group, life got busy and, while all the people were really nice and welcoming, they were not from my neighborhood. They would talk about things happening in Longfellow and I was left out, not in a mean way, but because I was visiting from a different, though nearby, neighborhood with different concerns and needs. It took me some time to get through Who Do We Choose To Be? because it is not the sort of book you can swallow in big gulps. It is a sipping book not only because it was written to be read that way, but also because the subject matter is unbalancing. Basically, the book is about facing the profoundly disruptive reality we find ourselves in, reclaiming leadership as a calling and profession that creates possibility and human community, and fosters “islands of sanity” where we bring out the best in each other instead of the worst. How could this book be so hard to read, you ask? If you have been paying attention to the world, you won’t be surprised to learn that Wheatley spends a lot of time discussing collapse—environmental collapse, cultural collapse, political, economic, pretty much the collapse of the world as we know it. But even if you have been paying attention, to have it all laid out in a way that gives no opportunity to pretend collapse is not happening and that does not come with a paternalistic pat on the head and a soothing, don’t worry everything will be ok, well it’s sobering. But I kept breathing, kept my eyes open, and kept reading because I believe, as Wheatley insists over and over, that we have a choice. With endings of any kind there are opportunities for new beginnings. And when the endings are really big, so are the opportunities. Possibilities open up that were closed before. Collapse does not mean we will end up in a Mad Max world. It is only one possibility of many. The book made me think a number of times of the Tower card in the Tarot. 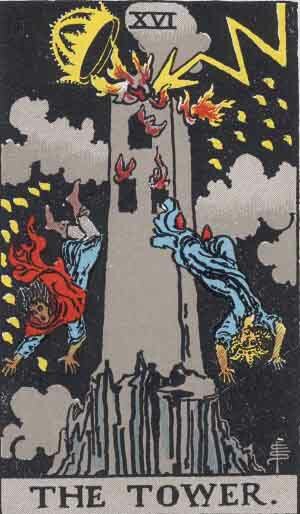 It’s a scary looking card, lightning hitting a tower and people falling out of it, and is associated with destruction and sudden change but can mean liberation too. I also thought often about the Death card in Tarot. People are terrified when the card comes up in a reading. The Death card more often than not means giving up the superficial and focusing on what is truly important. These cards kept hovering in my mind because to me they speak of change, of endings and beginnings, of vulnerability and the chance to learn and grow. It’s like compost. Compost is made of the decay of formerly living plants, but compost itself is dynamically alive and feeds the soil and roots of plants, providing important nutrients for growth and new life. In the end the book is about taking responsibility for yourself and the future of the world. Who do you want to be as we move through collapse and the aftermath? Do you choose to be the person who sits back in despair wringing your hands and complaining no one is stepping up to fix things? Or the person with compassion and an ethic of care who steps up and does what needs to be done to create something new and good? The stepping up part is terrifying, at least it is for me. I am not the person in any situation who is what we think of as a natural leader. But the leadership Wheatley writes about is not the “I’m in charge of you and everything else” sort. It is the kind of leadership that requires you have no ego, that calls for inclusiveness, that listens and asks questions, builds community and consensus. These things I can do. These things we all can do. Who do we choose to be? Because it is a choice. I know who I choose to be. I’ve been taking little steps, preparing, learning, looking, listening. But also speaking up more. The Longfellow Transition group is going through a leadership change and having meetings about the direction they want to proceed in. One of those might be opening up to the surrounding neighborhoods and if that is the case, I will join them and work to bring in my neighbors. If they decide to stick with their own neighborhood, I am planning on figuring out how to start a transition group for my neighborhood and hoping to partner and learn from the Longfellow group. I want to be the sort of person who helps create a resilient and thriving community. A note on climate anxiety and mental health. The American Psychological Association released a report in 2017 on mental health and climate. While it is mostly an assessment of the issues, there are some tips at the end to help individuals and communities foster good mental health. But sometimes tips in a pdf report are not enough. Please, if you ever feel yourself in mental distress, seek help from a professional. Climate change is not going to go away and mental suffering because of it is very real and not to be dismissed. Resilience begins with good mental health, so be kind and caring towards yourself and find someone who can help you. Yours is the first post that really addresses the kind of anxiety and dread I’ve been feeling every day for the past two years. I was going all out working for political reform until the mid-term elections, when every single candidate I donated to and worked for lost. Since then I’ve lost hope. Maybe reading this book would help pull me back from the edge a bit. By the way, I’ve been wondering how you are doing. It was minus six at noon here in Ohio, and I read that it’s much colder where you are. How are the chickens? Hi Jeanne! So very sorry to hear about your anxiety and dread. It’s a real thing that few are addressing. Who Do You Choose To Be and Active Hope are both fantastic. Another book that might provide some solace is Wild Comfort by Kathleen Dean Moore. It’s nature writing at its best. She wrote it during a time of grief and her stories are infused with comfort, wisdom and kindness. As to the cold, it was -27 this morning with a windchill of -53. Currently it’s -15 and windchill is -29. The Dashwoods are doing ok. We’ve had the heat lamp on in their coop since yesterday afternoon. It doesn’t actually make anything warm, but it takes the edge off. Their combs and wattles are covered in vaseline to help prevent frostbite. We only have to make it through tonight and Thursday morning and then temperatures should be more moderate again. Thanks for asking! And do keep warm and take care! You are so right about the Tarot cards and the compost. I find that going out for walks in the countryside are very good stressbusters, similar to your bike rides I suppose. You would think that there is plenty of evidence to show what global warming is doing to us but there is no end to some people’s stupidity it seems. Meanwhile I plant trees and bee plants.- and live in hope. This book sounds worth the read. Climate Change is indeed the greatest threat to humanity. I am actually optimistic about almost every other aspect of the world, but Climate Change can easily mean all that other optimistism is for naught. In the end, the best we can do is to act to try to make things better. I should give this book a read. I felt the same all fall — it was difficult. I was definitely experiencing a decline in my mental and emotional health. I finally just had to take a pretty solid news break and focus on small local things: the house, the cat, my family. It helped; I feel better now although I can still feel the anxiety and dread lingering at the corners when I imbibe too much news. Thank you for being such a good example of hopeful action. You are inspiring me! I have been contemplating these things a lot as well, and both of these books look like really excellent places to look for coping and action strategies for dealing with these feelings. Thanks for sharing! I’m about 3/4 of the way through The Overstory right now. So this post is…. timely. Thank you so much for your post, it is hard to stay hopeful and positive in face of great threats that seem so out of our control. I will definitely check out the books you recommend. Thanks for these recommendations: worthwhile reading for sure!